Viewing the art created within his ministry will serve as a precursor to, and direct reminder of, the messages presented, inspiring deeper corporate growth. Our brains rely on at least one of three learning styles to process and retain information, whether audibly, visually, or kinesthetically. Of the three, learning visually is the most commonly utilized. The church connects with auditory learners quite effectively through music and vocal message presentations. Kinesthetic learners find their place in the church through the volunteer and mission opportunities we offer. Visual learners, however, are very much left out in the cold. Stage design, lighting, colorful graphics are good amenities but they only guide the viewer to the auditory message. To reach people on a visual level, the visual element must communicate the message independently. This is where David comes in, interpreting God’s word and the message of the church visually to reach every learning style within the Body. David is an artist in the Piedmont of North Carolina, creating art in a variety of media that has a depth of layered meaning and abundance of emotion. His goal is to balance objectivity and subjectivity, communicating the thought process behind each creation while allowing enough flexibility for the viewer to find a personal connection with the art. Growing up the son of a Christian pastor and church planter, God and the Christian community were a consistent part of my life. He experienced the full spectrum of the church from culture-changing highs to mission-tainting lows. Through the positive and negative, he remained loyal to his roots. He now chooses to apply his natural abilities and learned skills to give back to his Creator by positively impacting the world he inhabits. While his mission has never changed, the way it manifests continues to evolve. Progressing from simply being a loyal friend in grade school, then creative expression through music and drama during college, deeper community involvement since graduation. Combining these efforts and related experiences led him back to my roots; creating visual art. 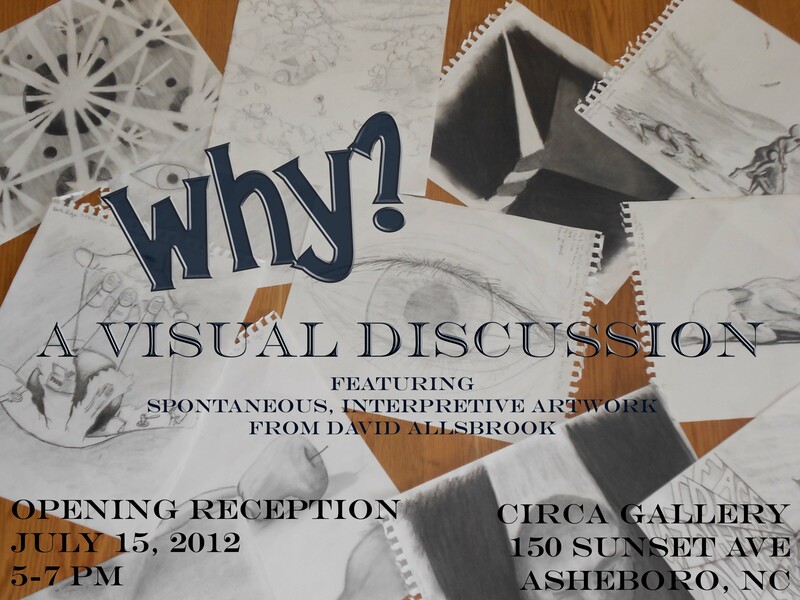 The reception is free and open to the public Sunday July 15, 2012 5:00 to 7:00 p.m at Circa Gallery 150 Sunset Avenue, Asheboro, N.C 27203. The Artist will be on hand to meet and discuss his works. The show will be on display July 15 through August 14, 2012. Click here to view the article in Asheboro Magazine!